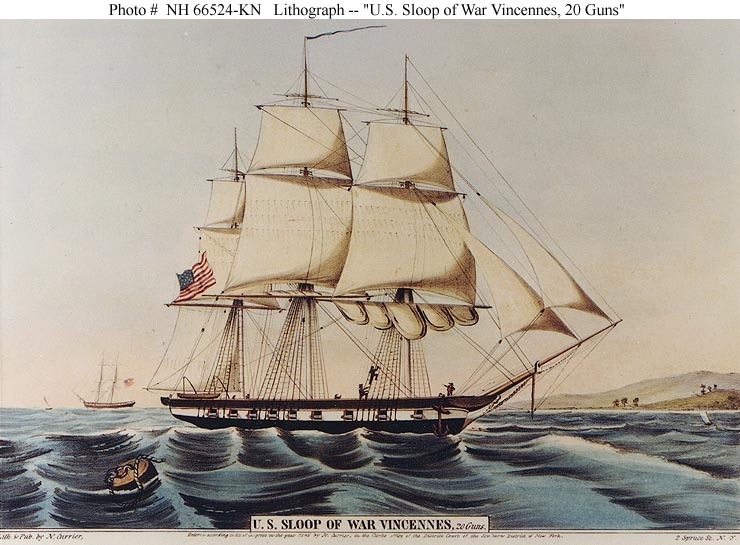 USS Vincennes, a 703-ton Boston class sloop of war, was built at the Brooklyn Navy Yard, New York. Commissioned in August 1826, she sailed to the Pacific by way of Cape Horn and cruised extensively in that ocean until 1830. Her return voyage was made by way of China, the Philippines, the Indian Ocean and the Cape of Good Hope, with arrival in New York in June 1830. Vincennes had thus circumnavigated the Earth during nearly four years, becoming the first U.S. Navy ship to do so. Following repairs, in 1831-32 Vincennes operated in the West Indies and the Gulf of Mexico. 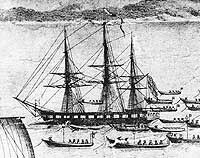 She departed for a second Pacific deployment in 1833, again sailing around the Globe to return to the U.S. East Coast in June 1836. The sloop was then refitted with a light spar deck for service as flagship of the United States Exploring Expedition. Commanded by Lieutenant Charles Wilkes, the expedition left Hampton Roads, Virginia, in August 1838 and passed around Cape Horn early in 1839. Following survey operations and other scientific work along the west coast of South America and in the South Pacific during the rest of the year, in late 1839 Vincennes arrived at Sydney, Australia, her base for a pioneering cruise to Antarctica. Between mid-January and mid-February 1840, she operated along the icy coast of the southernmost continent. The remainder of her deployment included visits to the islands of the South Pacific, Hawaii, the Columbia River area, California, Wake Island, the Philippines and South Africa. This third voyage around the World ended at New York in June 1842. 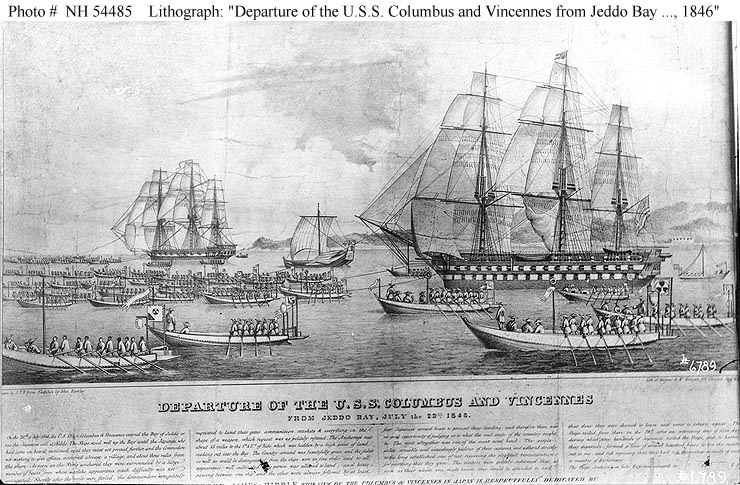 Home Squadron service in the Caribbean area occupied Vincennes until mid-1844. Nearly a year later she left the East Coast for another trip, this time eastbound, to Asian waters. In July 1846, in company with the ship-of-the-line Columbus, she attempted to pay a diplomatic call on Japan, but the effort was rebuffed by Japanese authorities. After further duty on the China Station, Vincennes came back to New York in April 1847. Her next cruise, beginning in late 1849, took her back to the Pacific for operations along the west coasts of South and North America and a visit to Hawaii. Repaired at New York between September 1852 and March 1853, soon thereafter the sloop began another three years of exploration work, this time involving surveys in the western and northern Pacific. Vincennes operated with the African Squadron in 1857-1860. During the Civil War she was employed along the Gulf Coast. She fought a battle with the ram Manassas and other Confederate ships on 12 October 1861. Later in that year she captured the would-be blockade runner Empress and spent much of the rest of the conflict on guard duty at Ship Island, Mississippi. Completing a career that made her one of the Navy's most widely-travelled ships, USS Vincennes was decommissioned in August 1865 and sold in October 1867. This page features all the views we have related to USS Vincennes (1826-1867). Colored lithograph published by N. Currier, 2 Spruce Street, New York City, 1845. 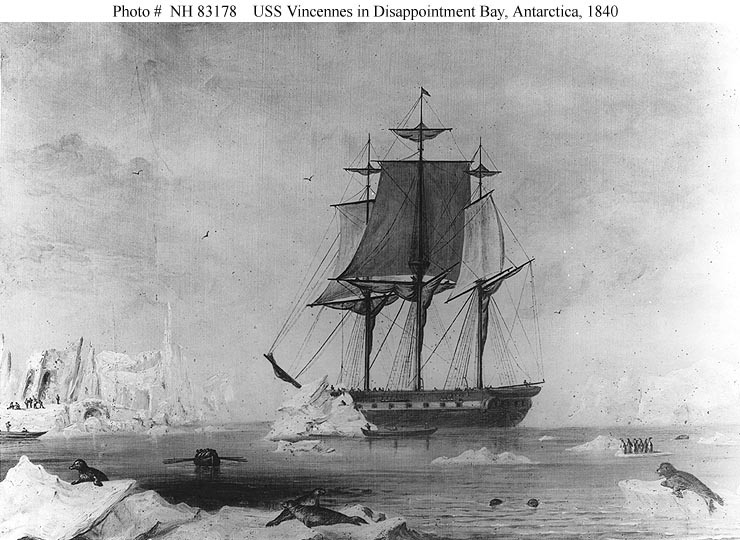 Courtesy of the Naval Art Collection, Washington, D.C.
19th Century photograph of a painting (based on a sketch by Lieutenant Charles Wilkes, USN), depicting the ship in Disappointment Bay, Antarctica, circa January-February 1840. Collection of Captain Glenn Howell, 1974. Line engraving by C.A. 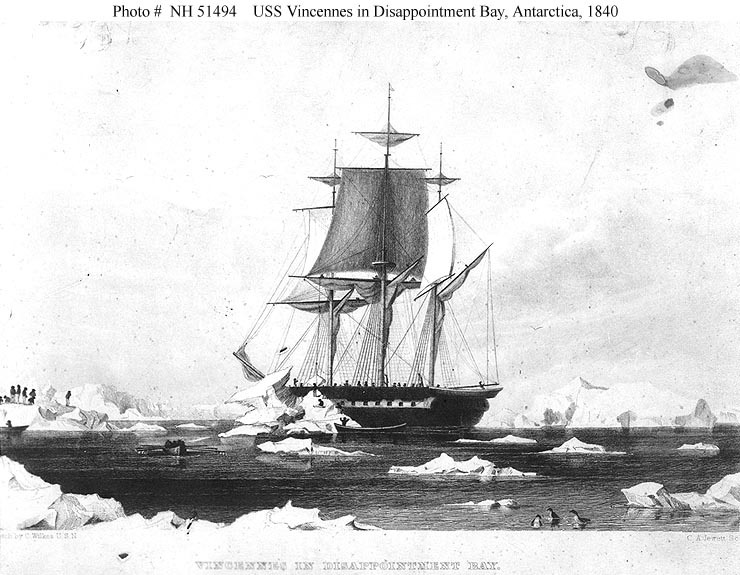 Jewett, after a sketch by Lieutenant Charles Wilkes, USN, depicting USS Vincennes in the Antarctic ice, circa January-February 1840. 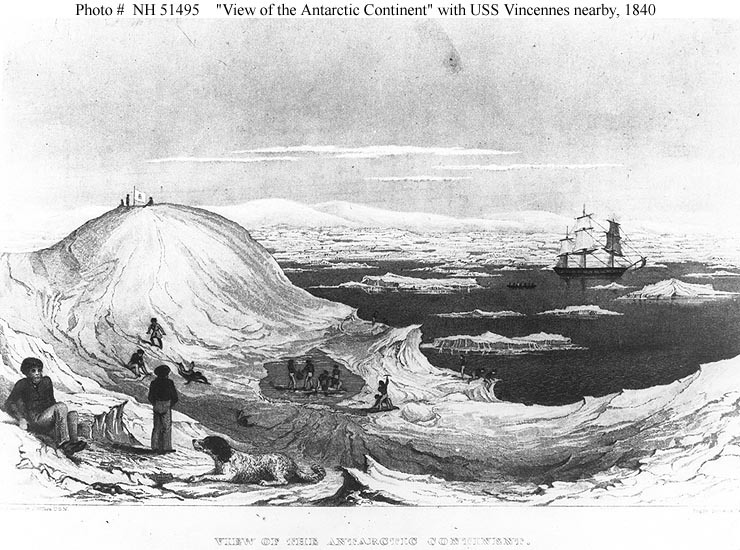 "View of the Antarctic Continent"
Line engraving by Jorban & Halpin, after a sketch by Lieutenant Charles Wilkes, USN, depicting men and dogs of the U.S. Exploring Expedition "ashore" on the ice, with the Antarctic mountains in the distance, circa January-February 1840. USS Vincennes is amid the ice flows at right. The print is copied from "U.S. Exploring Expedition", Volume II. 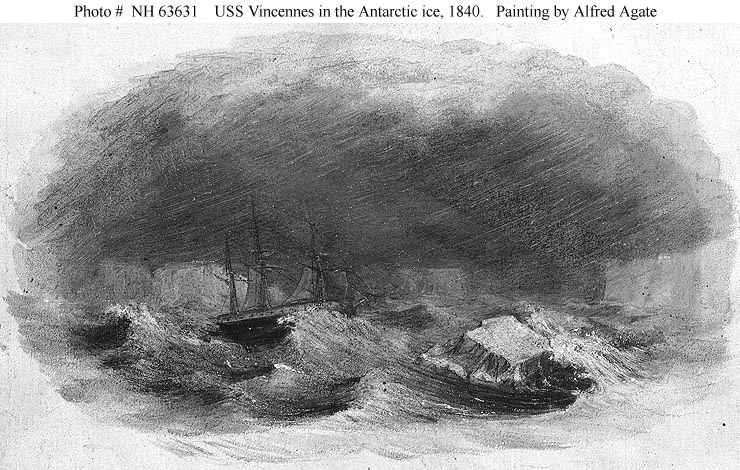 Painting by Alfred Agate, depicting the ship riding out a storm while cruising in the ice off Antarctica, circa January-February 1840. "The U.S.S. 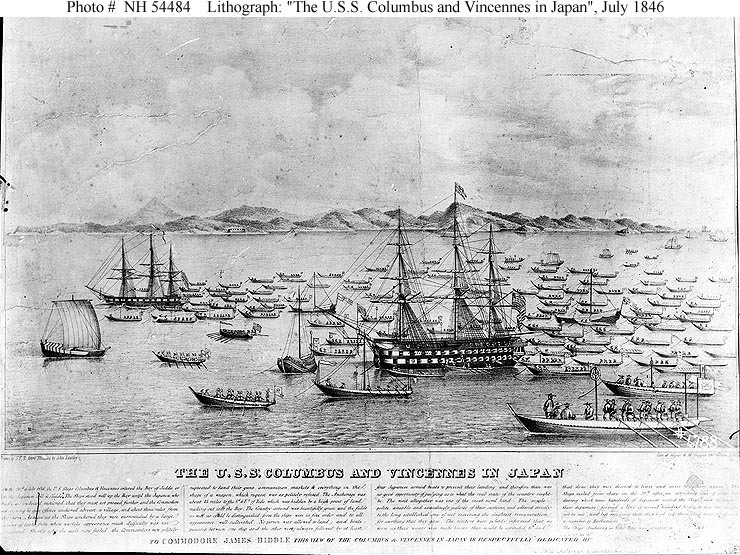 Columbus and Vincennes in Japan"
Contemporary lithograph published by Wagner & McGuigan, based on sketches by John Eastly. It depicts USS Columbus (right center), flagship of Commodore James Biddle, and USS Vincennes (left) anchored in Jeddo Bay, Japan, circa 20-29 July 1846. They are surrounded by a fleet of Japanese small craft, which acted to prevent the ships from communicating with the shore. See Photo # NH 54485 (extended caption) for the text printed at the bottom of this print. Courtesy of Mrs. Macomb, Washington, D.C., circa 1920. 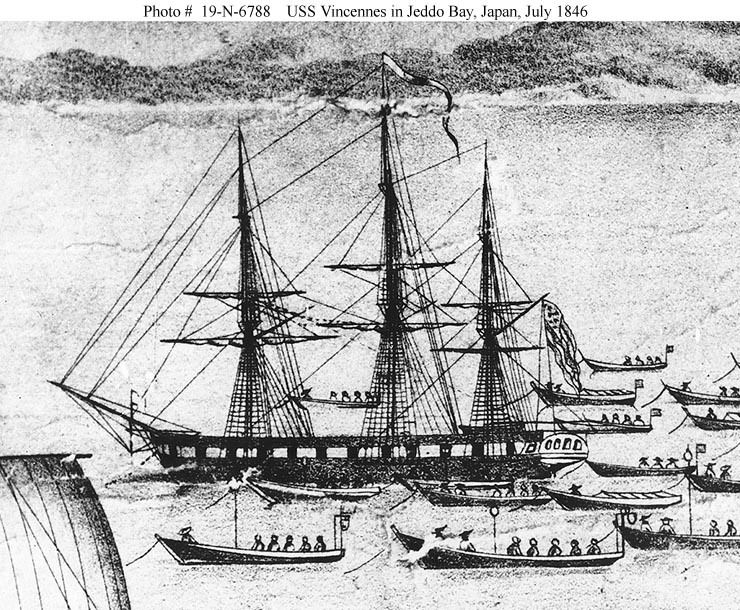 At anchor in Jeddo (Tokyo) Bay, Japan, circa 20-29 July 1846, surrounded by Japanese small craft. This image is cropped from a contemporary lithograph published by Wagner & McGuigan, based on sketches by John Eastly. See Photo # NH 54484. "Departure of the U.S.S. Columbus and Vincennes from Jeddo Bay, July the 29th 1846"
Contemporary lithograph published by Wagner & McGuigan, based on sketches by John Eastly. It depicts USS Columbus (right), flagship of Commodore James Biddle, and USS Vincennes (left) being towed out of Jeddo Bay, Japan, by a fleet of Japanese small craft on 29 July 1846. The nine days these ships spent in Jeddo (Tokyo) Bay was the first visit made by the U.S. Navy to Japanese waters. 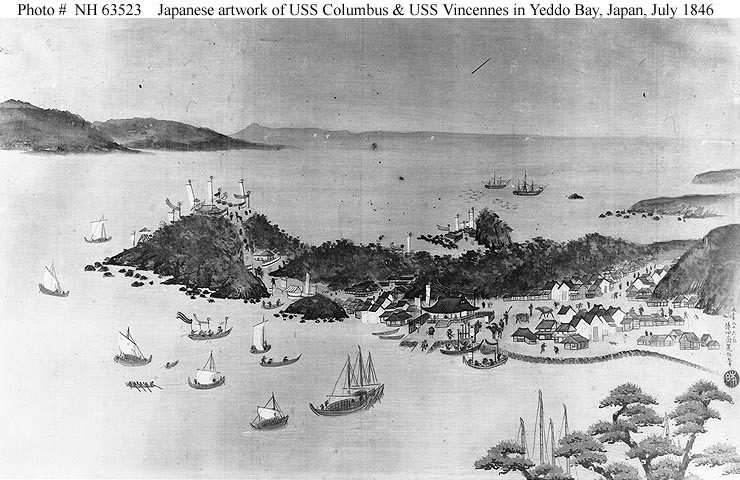 Copy made by Mr. Renjo Shimo Oka from an original Japanese painting, depicting USS Columbus and USS Vincennes anchored in Yeddo (Tokyo) Bay, Japan, circa 20-29 July 1846. They were under the command of Commodore James Biddle, USN. Oil on canvas, 22" by 16", by Edward Kern (1823-1894). Signed by the artist. 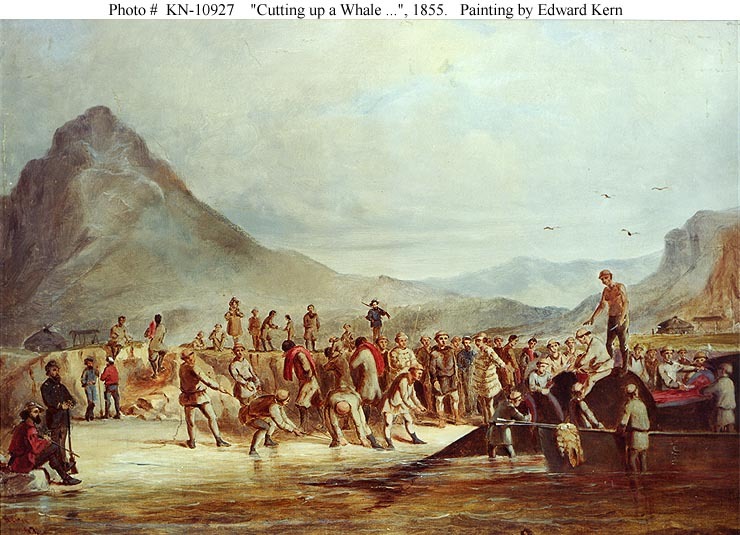 This painting depicts "native half-breeds" at work on the whale, 1855. Also present are U.S. Marine guards from the U.S. Sloop-of-War Vincennes, landed to protect a surveying party during the North Pacific Survey Expedition, under Commander John Rodgers, USN. Painting in the U.S. Naval Academy Museum Collection. Transferred from the Bureau of Navigation, 1923. "The Battle at the Southwest Pass -- The Ram 'Manassas' attacking the 'Richmond.' -- Sketched by an Officer of the 'Richmond'." Line engraving published in "Harper's Weekly", 1861, depicting CSS Manassas attacking USS Richmond near the Head of Passes, Mississippi River, on 12 October 1861. Other ships depicted include the U.S. sailing sloops of war Vincennes and Preble (in left center and at right).